We are launching not one but two free beginners courses, the first will be Monday evenings starting on the 12 January with Glenn. It is that time when we have been reviewing the club clothing prices, you know how this story now goes normally…. Anyway, we have managed to negotiate for our members a better deal – therefore from the 1 January 2015 – the prices of virtually all club kit is being REDUCED– we will have the new form loaded on the club shop on the 1st January..
For example the club tee shirt (Unisex or Ladies) will be reduced from £11 to £9.50 and vest from £9.50 to £8.25 and these include a name one side. Couple of the smaller selling lines are staying the same price and the Children’s cotton tee is going up by 10p. If only Redway Runners made Lager! We are having an extra club run on New Years eve, forget your Ultras and long distance running this run will take 2 years, we will start the run in 2014 and finish the run in 2015! We are meeting at Special Ops, 366 Simpson Road, Simpson, MK6 3AG at 11.15pm (23:15) and starting the run at 11:30pm (23:30). It will be about a 45 minute run, with loop backs and finishing back at the same place as the start. Remember your head torch as it will be dark. At the end we hope to have a bonfire going so bring some nibbles/marshmallows to roast and a drink to finish the night/morning off. We also manned the water station at mile 9 (picture below) at Tear Drop Lakes organised by Diane, which included Paul the Christmas Tree. Well done to all that took part and helped on the day. ‘I said to my fellow running son, we will do this one again! Can you believe locals loaded up their children who gave out jelly beans en route and in addition to the water stations and gel/jelly/bear give-aways? 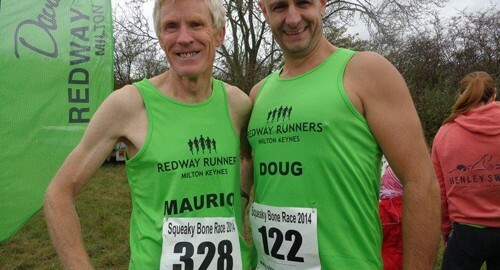 And I have never seen so many Redway Runner t shirts – they kept me going in the 16-19 zone when I was flagging! Thanks to all.’. David Stride, Dawn Blaber, Andy Sangster and Maia McQuarrie – well done your journey begins. Thanks to all those that bought children’s presents for Barnardos – we will be getting them passed on over the next couple of days. So many thanks to Julie Martin and everyone else that helped to make last night a fantastic evening. 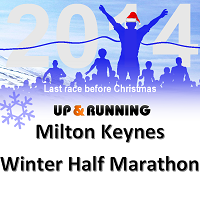 Finally we have booked next years for Friday 4 December 2015.